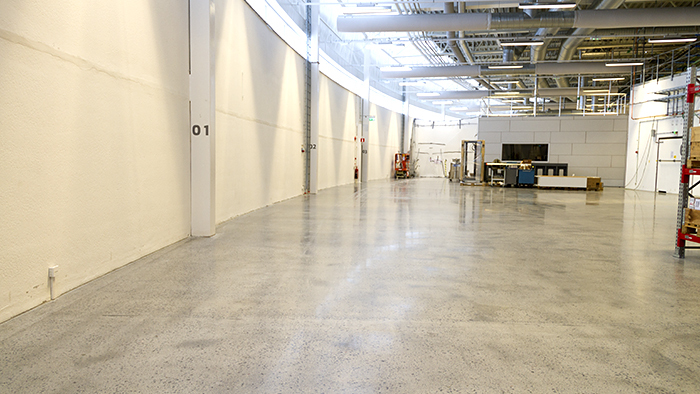 MAX IV - Research equipment is installed on the finished floor. 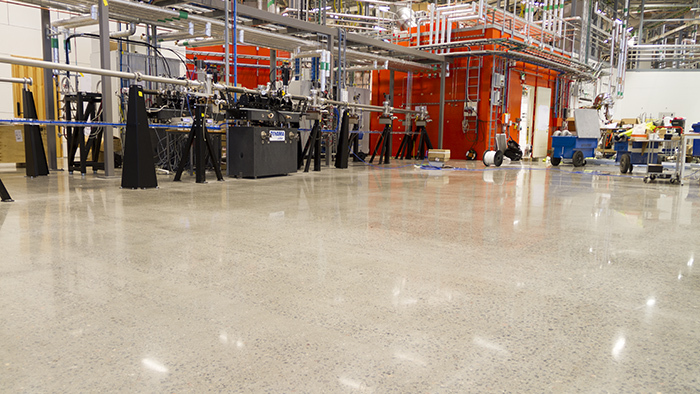 MAX IV - The finished floor – HTC Superfloor™ Silver. MAX IV - The round building is a full 528 m in circumference. MAX IV - The grinding takes place in large tents. MAX IV - Sweden’s first DURATIQ in action. In Lund, researchers from all over the world come together to make the invisible visible. 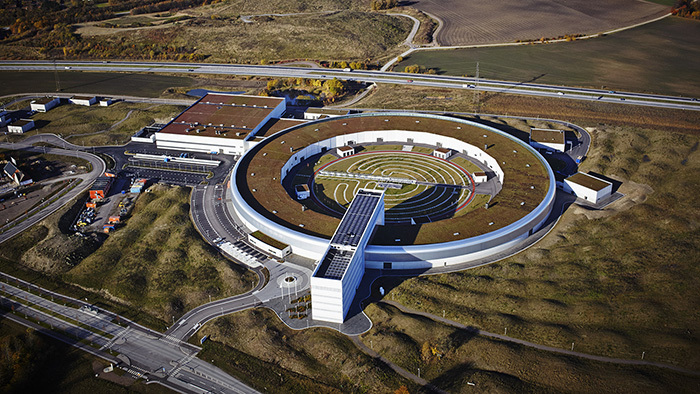 The world’s brightest synchrotron facility, MAX IV was Sweden’s biggest and most ambitious research infrastructure investment and opened in 2016. The research underway there – which uses intensive X-rays – may lead to better catalysts and batteries, more effective antibiotics or even something as revolutionary as artificial photosynthesis. Only time will tell! When visiting MAX IV, one thing you are struck by is the building itself. With a circumference of 528 m, the round construction is roughly the same size as the Colosseum in Rome. The building stands on a concrete slab roughly five metres thick, which keeps vibrations away from the surrounding roads. In keeping with the work going on at the facility, a floor for the future has been selected for this surface – specifically, an HTC Superfloor™ Silver. In all, roughly 13,000 square metres of concrete will gradually be transformed into a sustainable, durable and smooth floor. When it comes to issues of maintenance and energy consumption, modern research facilities like MAX IV have to be economical with their resources. 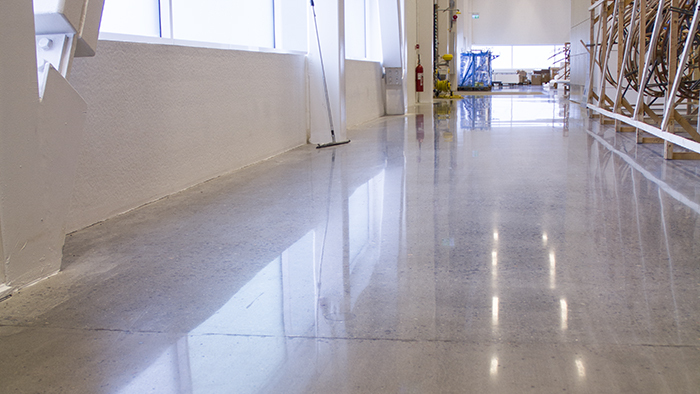 In this regard, a polished concrete floor – with low maintenance and life cycle costs – is the optimal choice. 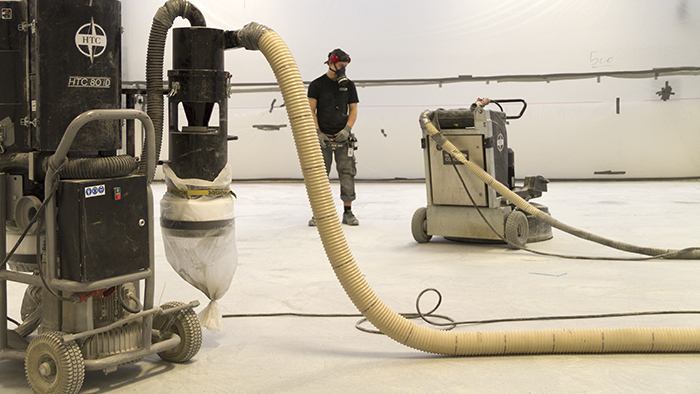 Nordic Concrete, specialists in casting and floor grinding, has been contracted to prepare the concrete floor in line with clear requirements. 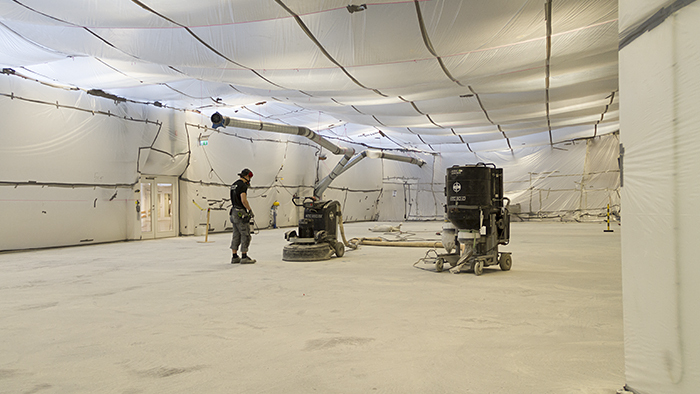 “This is a challenging project in a number of ways – partly due to the concrete surface, but also due to the fact that the facility itself is operational while the grinding is taking place,” says Marcus Svensson, owner of Nordic Concrete. “Although the grinding method and HTC equipment that we are using are essentially dust-free, there are particularly stringent requirements in place as we are working in a research environment where the smallest particles in existence are being studied. A layer of dust on the sensitive measuring instruments could mean expensive downtime for the research being conducted,” Marcus explains. To ensure the environment remains dust-free and doesn’t interfere with the research taking place, large, thick tents with extractors for heat and airborne dust need to be built. 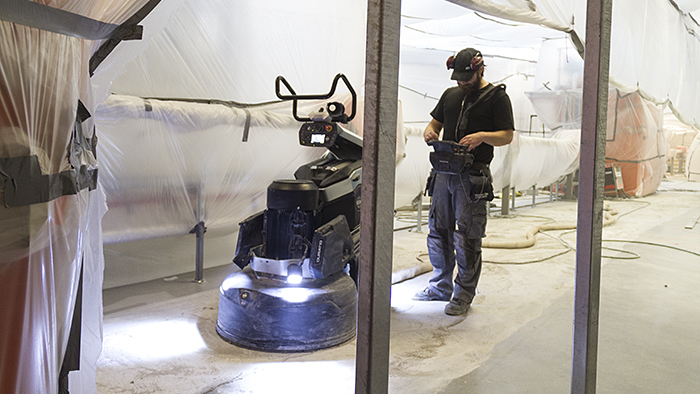 The grinding takes place within the tents, using machines and tools from HTC. As with HTC’s other previous grinding machine models, DURATIQ is developed to generate minimal vibrations. This is extremely important here, as the research instruments are very sensitive to vibrations in particular. “Considering the circumstances – a very sensitive research environment with extremely stringent performance and surface requirements – a lot is expected of the machines and tools,” Levén explains. 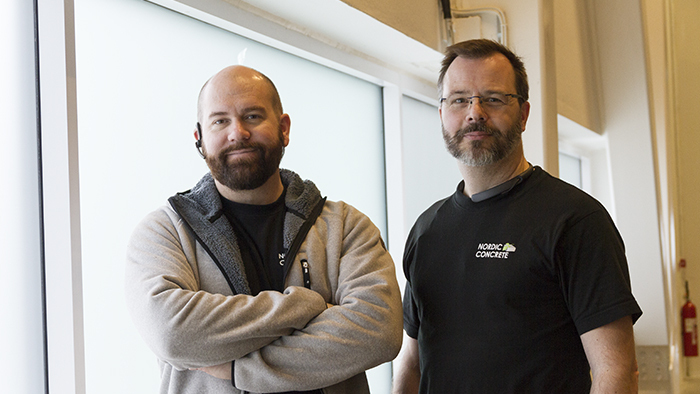 “This, alongside our breadth of experience and professional know-how, means that we can deliver good results,” he adds. Pores in the concrete floor must also be filled during the grinding process to create a smooth surface. The work being undertaken at MAX IV requires weights of over 35 tonnes to be moved using air lifting cushions, so any sharp edges could have devastating consequences. Both Nordic Concrete and HTC are delighted to be part of MAX IV’s journey into the future. It is not yet known exactly what innovations the facility will produce, but we can be sure that the floor will last.